(IRVINE, Calif.) May 3, 2018—HI-CHEW™, the immensely fruity, intensely chewy candy, is announcing the launch of all new HI-CHEW™ Açaí and HI-CHEW™ Tropical Mix, with individually wrapped Kiwi, Mango and Pineapple flavors. Just in time for the warmer months ahead, these two new product offerings are upping the flavor ante, giving consumers’ taste buds an authentic and bright explosion of real-fruit flavor packed into each chewy bite. HI-CHEW™ Açaí and Tropical Mix deliver the same juiciness, chewy texture, and real-fruit flavor HI-CHEW™ fans love. Made with real fruit juices and purees, each chew is the perfect snack for candy enthusiasts of all ages. New HI-CHEW™ Açaí delivers a bright burst of sweetness and includes real chia seeds. The açaí berry, high in antioxidants, is known for its superfood properties and refreshingly delicious fruit flavor. Each Açaí stick comes with 10 individually wrapped chews, giving fans a great way to enjoy this popular flavor on-the-go. HI-CHEW™ Tropical Mix includes an exotic mix of flavors, including fan-favorite Mango, and two exciting new additions, Kiwi and Pineapple. New to the national HI-CHEW™ flavor portfolio, Pineapple delivers a bright and juicy flavor with a balanced blend of sweet and tart. With the three delicious flavors to choose from, the Tropical Mix is sure to provide a sweet treat for all the summer adventures ahead. This year, Morinaga America, Inc. celebrates 10 years of innovating HI-CHEW™ flavors for its ever-growing and enthusiastic United States fan base. Each flavor within the HI-CHEW™ portfolio, including the new Açaí and Tropical Mix, are selected and tested by a team of flavor experts who conduct detailed research into consumers’ palates, preferences and fruit trends in the market. This selective process is what brings the flavors HI-CHEW™ fans know and love to life. As the brand continues to grow in the United States, HI-CHEW’s ongoing success is a true testament to the candy’s can’t-get-enough, authentic fruit flavors and unique chewy texture. HI-CHEW™ Açaí and Tropical Mix bags are available at various retailers nationwide and online at www.HI-CHEW.com. Açaí has a suggested retail price of $1.39 (varies per market). The Tropical Mix bag is available for a suggested retail price of $2.39 (varies per market). 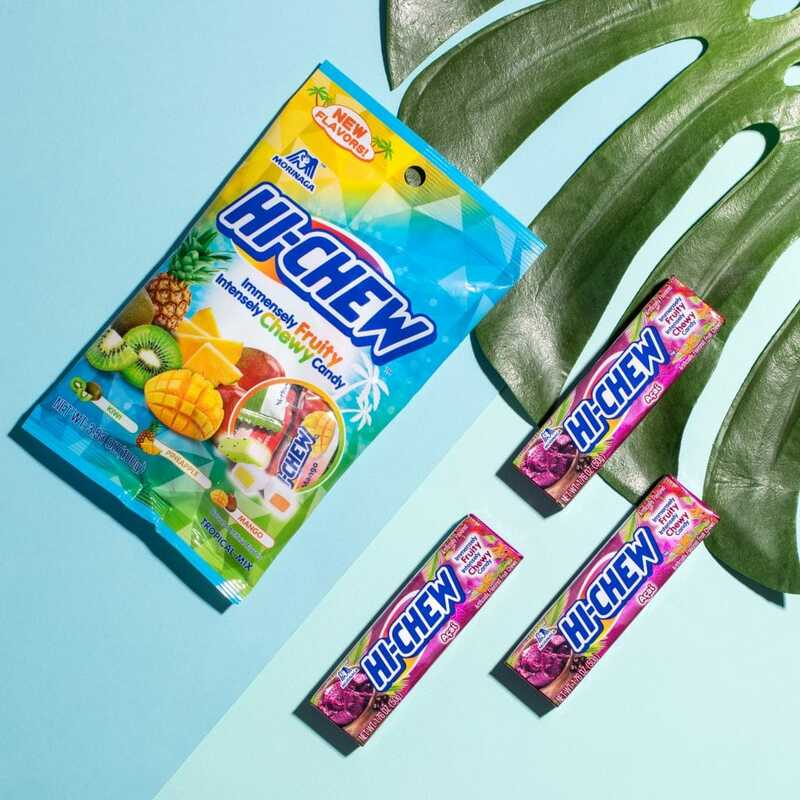 To learn more about HI-CHEW™, please like us on Facebook, and follow us on Instagram (@HICHEWUSA) and Twitter (@HICHEW). Established in 2008, Morinaga America, Inc. is the official manufacturer and distributor of HI-CHEW™ in the United States. With over 170 flavors of HI-CHEW™ having debuted in Japan, Morinaga America, Inc. has introduced the United States market to the best of Japanese confectionery. Morinaga America, Inc. (marketing and sales) and Morinaga America Foods, Inc. (manufacturing) are wholly-owned subsidiaries of Morinaga & Co., Ltd., which began in 1899 as the first, modern candy maker and producer of chocolates in Japan. In 2015, Morinaga America, Inc. opened its first United States manufacturing facility in North Carolina. The history of Morinaga stretches back over a century, when company founder Taichiro Morinaga brought his candy making skills to Japan from America in the 1800s. HI-CHEW™ has long been the best-selling soft candy in Japan and continues to see year-over-year growth throughout other parts of Asia and in the United States. In the United States, HI-CHEW™ is currently offered in the following flavors: Strawberry, Green Apple, Mango, Grape, Banana, Kiwi, and Açaí. HI-CHEW™ also offers Sours in Lemon, Lime and Grapefruit, Fizzies in Cola and Orange Soda, and a new Tropical Mix with Kiwi, Mango and Pineapple. HI-CHEW™ is made with real fruit juice and purees and is 100% free of gluten, cholesterol and artificial colors. HI-CHEW™ continues to expand fruity, chewy flavor offerings annually.